It’s been over a decade since I’ve last played a Call of Duty game. The original release, simply titled Call of Duty, was one of my favorite shooters of that time, along with Vietcong, another less known first-person war game that focused on the conflict in Vietnam during the 1960s. Both games had a lot in common. Their gameplay that was heavily focused on playing in squads, and the shooting introduced iron sights in a realistic manner for the very first time. They also featured a lot of historical events that for the most part, helped show the trauma the people who lived through those conflicts had to endure. Games history, however, treated both franchises quite differently. While Call of Duty went on to spawn a multi-billionaire with yearly releases that sell millions of copies worldwide, while Vietcong mostly languished in obscurity, with a console sequel that didn’t capture what made the first one so special. So it was extremely interesting to dive into a current day Call of Duty game, one which dives back into World War II after the series have long shifted away to focus of modern and futuristic combat. 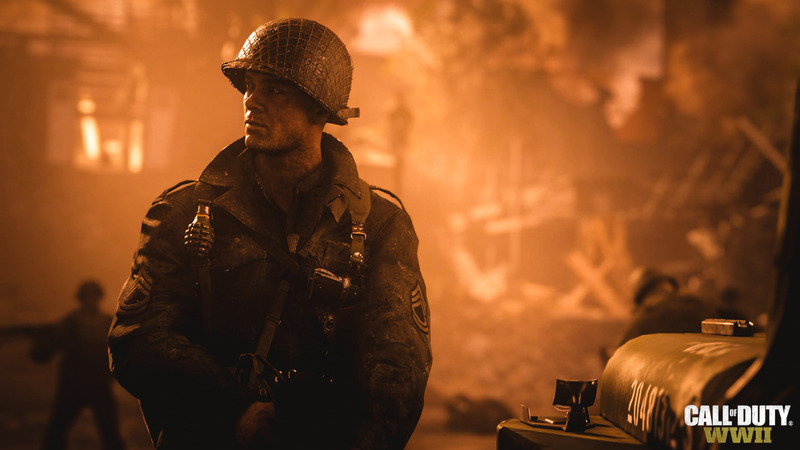 And in many surprising ways, Call of Duty WWII manages to feel like a game from the particular time period from the original, for better and mostly for worse. Call of Duty WWII tells the story of Pvt. Ronald “Red” Daniels, a Texas farm boy whose squad is sent in deep into the the many historic events of World War II, including, of course, the Normandy Beach landing during D-Day, as well as the taking of the last bridge over the River Rhine, and the liberation of prisoner labor camps in Germany. The story takes all the cues from now classic WWII films and series, like the obligatory Saving Private Ryan, Band of Brothers, Behind Enemy Lines and A Bridge Too Far. It feels like a hodge-podge of the most known elements of all of these, which certainly works as a backdrop for a videogame, as many previously successful releases, including the original Call of Duty have proved. It’s by no means original, but it gets the job done. It hits all the notes you’d expect, like the conflict between two leaders having to deal with their opposing views as to how to follow orders, the inter-personal relationships between squaddies, the atrocities committed during WWII and the general chaos and barbarity that ensued during the many different battles that occurred during that war. It’s quite unfortunate that the actual gameplay doesn’t really follow the standards of the story, feeling like a game stuck in time. Albeit it looks beautifully expensive to produce, CoD WWII’s extremely linear, with little actual agency. It feels like an extended theme park ride where you occasionally shoot people and watch them fall to their deaths in cartoonishly exaggerated ways. It only rarely remembers that there could be more to the war than just blowing stuff up, in a handful of clumsily-executed, constricted stealth sections, and the even fewer shifts to the skies in order to quickly fly a plane and defend the bombers coming to Daniels’ platoon’s rescue, or the criminally short stint where you have to battle enemy tanks while piloting a Sherman by yourself. The problem is that there’s never any sense that anyone is any danger but Daniels. Even when fighting among dozens of other troops, the shooting going on all around you is just for show, while the actual damage is aimed straight at you. Spawning enemies charge straight to you even when they’re surrounded, and even attack dogs just bee line to bite your face off regardless of its their surrounding. Everything that happens during the single player campaign feels like a play in which you’re the only player that matters, which is admittedly is true, but it could’ve been done in a less obvious way, with perhaps having less of an emphasis on the way everything revolves around a lowly private in a huge war scenario. It’s even more ridiculous when every single member of Daniels’ squad has their own specific prompt that only he can make use of, such as asking for more ammo from his C.O, health packs from another squaddie, or even marking enemy soldiers, which is handled by the gruff-but-with-a-heart-of-gold sargeant. Even during the aforementioned stealth sections, the gameplay is a little too conveniently planned out in order to force a certain pace upon you, with scripted enemy patrols that turn around at just the right moment in order for you to sneak by or take them out silently. Trial and error is as ever present thanks to events always playing out the same, so if you end up getting stuck in a unclearly marked checkpoint right before getting caught and killed, good luck, you’re gonna have to start it all over again. It’s the sort of style of design that would be fine if WWII was a game from 2001, but in 2017 there’s a little more to be expected, especially from one of this caliber. Still, there are some pretty neat aspects to the spectacle that is the single player campaign. For as rigid as everything is to following a pre-determined plan, there’s sense of awe that comes when it eventually plays out, such as the many explosions that Daniels always seem to be caught a little too close to, sending him (you, in nauseously tumbling, first-person fashion) flying and miraculously surviving, or what was probably my personal high mark of the campaign, a train derailing at high speed, tumbling off the track and ripping out trees from the ground, crashing into buildings, the works. While not particularly exciting to interact with, it’s pretty exciting to watch, at least. Following the current model of Call of Duty, CoD WWII’s main replayability draw is its multiplayer, and from what I could see, it features just about what’s expected from a modern first-person shooter, with team attack modes to free-for-all deathmatch, with plenty of territory control thrown in for good measure. 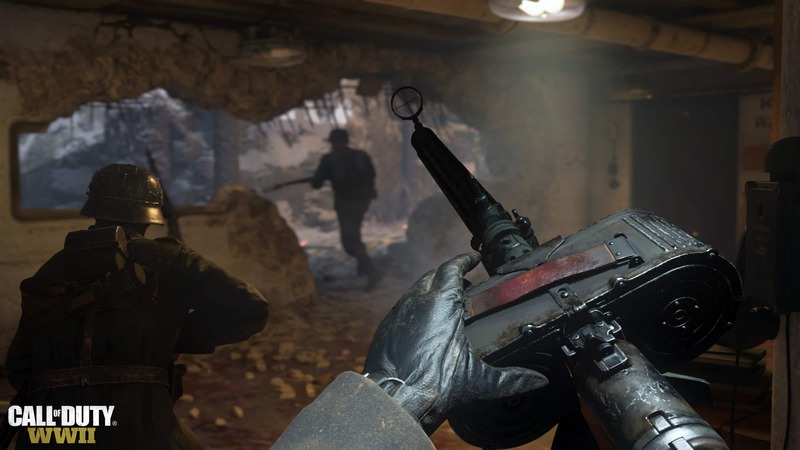 The speed of the game is definitely a factor in WWII, considering that the period weapons are considerably slower to handle and fire, which should play a big part in the flow of the matches. Then again, it’s just as easy to die playing online as it’s ever been. If playing a long lasting online shooter is up your alley, the new Call of Duty seems to tick every one of the boxes that a FPS should fill out. As for me, I’m a bigger fan of having a larger focus on cooperative modes, and to that regard, the other multiplayer mode that’s left, Nazi Zombies, should be more my cup of tea. Sure, the theme is a little long on the tooth, considering I’ve already played a lot of Sniper Elite’s zombie over the years, but CoD WWII’s manages to be a little different, considering it limits you to a team of four people that are holled up and have to defend themselves from hordes of decaying Nazis. It’s a dumb premise, but developer Sledgehammer aimed at making it more involved and a lot more atmospheric this time around, recalling back to some of the studio members’ previous work in the Dead Space games. The result is something that should please anyone that can manage to round up three friends who are willing to communicate and play together — I can only imagine how annoying it can get playing this mode with randoms, if Left 4 Dead was any indication back in the day. Playing through a current gen Call of Duty game was certainly a curious experience for me. 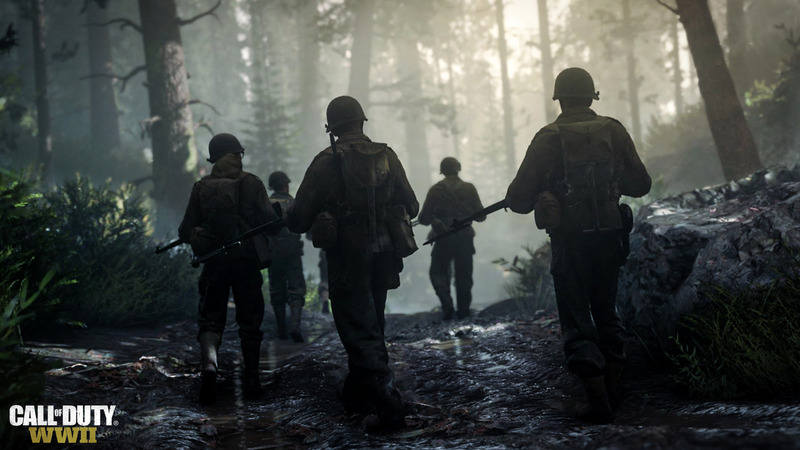 Although I wasn’t exactly intrigued by the theme — I’ve already played World War II to death in a bunch of other games in various other genres both in and out of first-person shooters — part of me hoped that Call of Duty WWII would manage to carve its own mark upon the previously trampled, but now vastly deserted space of games that take place during that particular point in history. It’s disappointing to see how little it moves the needle in terms of innovation, failing to impress even someone like me, who hasn’t been keeping up with the franchise. 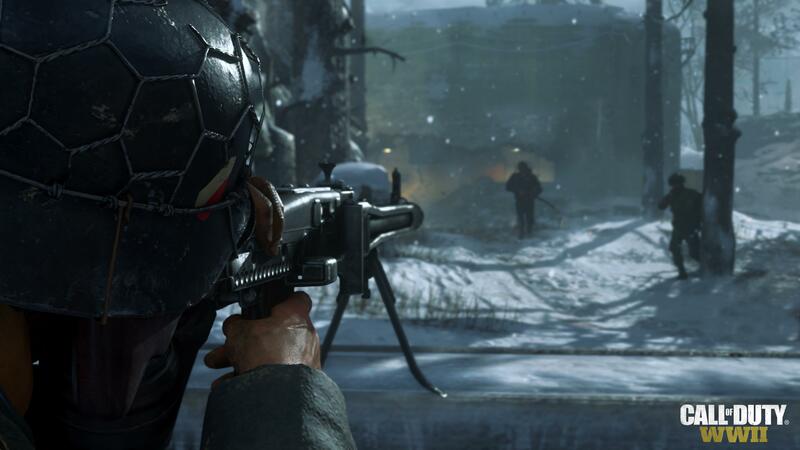 For as nostalgic as anyone could get about the World War II games of the late 1990s and early 2000s, it’s hard to imagine that Call of Duty WWII will rekindle the spark that they’ve shrunk to from the uncontrollable fire it used to be back then.